Dr Lisa Stead from the English and Film departments at the University of Exeter, talks about ‘Object Stories’, a series of short research films funded by the Research and Knowledge Transfer department. These films showcase artefacts from The Bill Douglas Cinema Museum and how they are used for academic research. Sometimes the more formal outputs of academic work can seem very distant from the actual objects, artefacts and raw materials of research. Articles and essays are one way of reflecting what we do as Film and Visual Culture researchers – but there are other ways to construct an argument, tell a story from our research, and reach new audiences with these ideas. Object Stories is a project that aims to think differently about disseminating research. 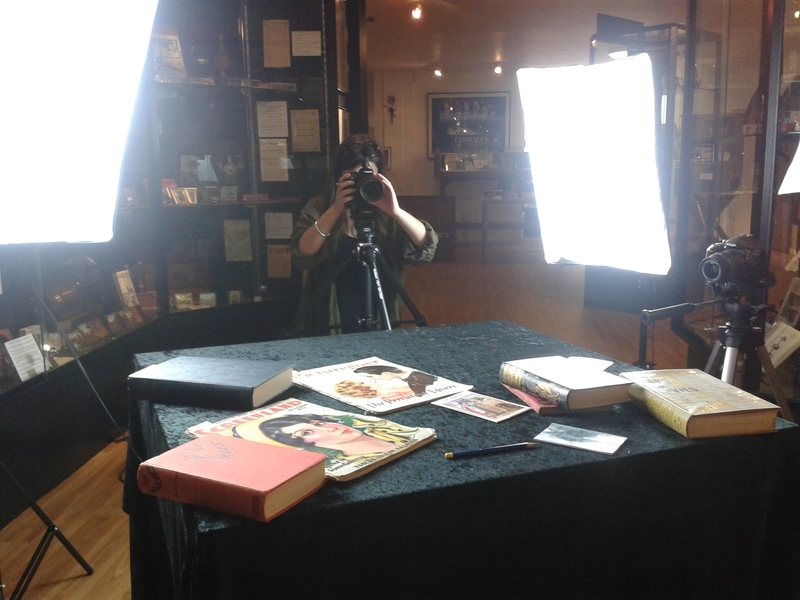 In doing so, it illuminates the rich body of historical materials housed within Exeter’s archives that are informing new research and projects in film history. The project involved the creation of a number of short films, in which academics in Film Studies at the University talk about how they use artefacts in the Bill Douglas Cinema Museum (BDC) for their research. The BDC is a unique resource to Exeter, housing one of the largest collections of material relating to moving image history in Britain, containing some 75,000 items. As Film Studies researchers and teachers, we use this collection constantly, and its holdings are an extremely important part of the diverse research projects currently underway within the Department of English and Film Studies. The project leads, myself and Dr Helen Hanson, secured initial funding for the project through a Research & Knowledge Transfer Impact funding award, and set about constructing a new framework for producing and disseminating research in the area of film and moving image history. We wanted these films to act as short visual essays, presenting information through images, sounds and movement, direct interaction with the objects that have informed our different research projects – from studies of gender and audiences, to film technologies and moving image histories. We worked closely with the museum’s curator, Dr Phil Wickham, in sourcing a wide range of objects that could showcase the best that the museum has to offer in our respective films. The visual essay allows us to clearly show the beauty of some of these early artefacts, particularly the colourful covers of early fan magazines, the illumination of hand painted lantern slides, and the rich detail of technical drawings and diagrams for early sound technologies. The films we have produced illustrate these objects through a focus on the current research of three Film Studies Academics working in the area of film history. Dr Helen Hanson is an expert in film sound; she is particularly interested in tracing the creative labour of film sound recordists and editors within the Hollywood studio system, figures that are relatively unknown in film history. Her films discuss her exploration of early sound craft and style in classical Hollywood cinema, using fan magazines and technical publications held in the BDC museum. Dr Hanson has recently been awarded a British Academy/Leverhulme small grant for her research into film sound histories, and her Object Stories visual essay is a fragment of larger research outputs that will include her monograph on the topic, Hollywood Soundscapes: Film Sound Style, Craft and Production 1931-1948, which is forthcoming with BFI/Palgrave MacMillan in 2016. Dr Joe Kember’s film explores the BDC’s extensive collection of magic lanterns, exploring slides and lectures produced by religious and campaigning groups. Dr Kember has recently won an award as part of a European consortium to the JPI Heritage scheme with a project called ‘A Million Pictures: Magic Lantern Slide Heritage as Artefacts in the Common European History of Learning’, and is co-authoring a book on popular entertainment in the South West, entitled Picture Going: Visual and Optical Shows 1820-1917 (2017). My own film features my work on women’s writings about cinemagoing in the interwar years, using fan magazines, postcards, novels and popular fictions from the BDC collection. These materials feature in my forthcoming monograph with Edinburgh University Press, which will be published in 2016, entitled Film Fictions: Women’s Writing, Selfhood and Intermediality in British Interwar Cinema. A big part of the project was the importance of learning through collaboration – not just with the museum, and each other, but with our filmmaker. The early stages of the project involved recruiting and training a student filmmaker through the Student Campus Partnerships scheme. We appointed third year English student Mini Warren to the project, who had developed her expertise as a filmmaker through XTV, the University’s student television station. We worked closely with Mini to find ways to map out the stories of our different research projects, and to communicate these through the expressive tools of the audio-visual essay. Mini sourced objects from the BDC collection, photographing, digitising, filming and bringing to life a wide range of different historical and ephemeral artefacts – from cigarette cards to posters, periodicals, manuals, toys and slides. Mini then worked with each academic in turn to storyboard and shoot the films, temporarily turning the museum’s lower gallery into a film studio, with the displays forming a lively backdrop for the shoot. Mini also documented her progress as the filmmaking developed, building an for the project audience through social media in advance of the release of the films by using Twitter to circulate images, screen grabs and clips. Working with Mini was a valuable learning opportunity for everyone involved. Making the films challenged us to find new ways to make our ideas and our work accessible, bringing to life the process and raw materials of research and making this visible. Presenting an idea to the camera is quite different to giving a lecture or writing a paper – we worked in detail on finding the right voice for this kind of format, and the right way to make the stories accessible and visually arresting, without losing a clear sense of the research questions we were formulating, and the critical ideas we wanted to articulate. This was a process of exchange and interaction between our own understandings of our work, and Mini’s strong sense of how an idea unfolds in the process of editing, layering and building through image and sound. The input of a filmmaker in turn created a new way of thinking about our respective research projects, but also a range of new opportunities to link this back into our teaching practice at Exeter. I will be using the practical skills gained from the project in teaching students to create vlog assignments, for example, on my new Level 3 module Film Studies, EAF3236 The Dream Palace: Cinemagoing, Audiences and Media. Beyond this, the project has created a new resource in the form of a brand new YouTube channel for the BDC, set up by our student filmmaker. The films have been used to launch the channel, which will serve as the audio-visual hub for research, teaching and impact projects connected to the museum. In this way, we hope that the films are the beginning of a larger project of collaboration and public dissemination for the exciting research taking placing in Film at Exeter. Our channel will interconnect Exeter’s unique archival holdings and staff expertise with a wider web of film research and film history dissemination through digital and social media. We also hope that it will inspire researchers, students and members of the public to visit the museum, make use of our archives, and delve into the wider histories of film and moving image culture. Since the project launch in early August, it has been exciting to see the films and their ideas spread across social media, viewed and passed on through diverse intersecting networks relating to film studies, museum studies, visual culture, and literary and cultural historians and students. More information about the project can be found on the BDC website. You can view the films on our Youtube channel here, and you can also follow the project through Twitter, with the hashtag #objectstories, and the Twitter handle @bdcmuseum. Dr Helen Hanson is a Senior Lecturer in Film Studies at the University of Exeter. She is currently Director of Postgraduate Research for Film Studies and Academic Director of the Bill Douglas Cinema Museum. Dr Lisa Stead is a Lecturer in British and American Cinema, teaching and researching with the Department of English and Film at Exeter, and am part of CIFR, Exeter’s Centre for Interdisciplinary Film Research. Her research primarily focuses on the relationships between literature, gender and audiences in the silent and early sound eras, focusing on intermedial relationships between women’s film and print culture. Dr Joe Kember is a Senior Lecturer in Film Studies at the University of Exeter. His research interests include early and silent cinema, Victorian and Edwardian popular entertainments, theories of film affect, and issues concerning the representation of the human face. He is currently completing a book concerning the exhibition of popular screen entertainments, 1840-1914. This entry was posted in Humanities by Site Administrator. Bookmark the permalink.